The Top 5 Reasons to Enroll in Online High School this Fall | The Pinnacle P.O.V. Summer is coming to an end. It’s the phrase that strikes fear and despair in the hearts of kids everywhere. While kids all over the world wallow at the loss of their seemingly endless supply of video games, pool parties and movie marathons, parents must now get their children back in a learning mindset. The end of summer may be the end of their child’s vacation, but it also signals the start of another school year. It’s time to turn in those video games for textbooks and swimsuits for back packs. But before your students make the pilgrimage back to the traditional brick-and-mortar classroom, there is an alternative. Taking classes at an online high school. As technology continues to become an integral part of our everyday lives, it’s no surprise that it is making an impact in the world of education. With devices such as iPads and interactive whiteboards, students are now seeing more interactive technologies incorporated in the curriculum, and there are even entire classes delivered and taught online. Just a few years ago, taking classes online seemed like just another pipe dream for most students. Whether it was a lack of accessibility or technology, online classes were only available to a select few. But over the past few years, online education and distance learning have made significant strides and online classes are not only more accessible, they are actually a legitimate alternative to traditional high schools. Students now have the ability to earn their high school diploma online and take online courses from anywhere that has a computer and internet connection. In a recent study, it was revealed that there are currently 3-million online-only students and more than 25,000 online courses offered in the U.S.
We are beginning to see more and more students leave the tradition classroom behind and join the countless others who are pursuing their high school diploma online. So as the new school year approaches, and you’re looking for a new learning environment for you or another student, taking online high school classes may be a great choice. But if you still aren’t sold on taking online high school classes, here are the top 5 reasons why enrolling in an online high school is the best option. 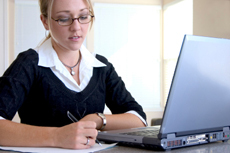 Flexibility – Probably the best advantage of taking online high school courses is their flexibility. Since the classes are available online and are accessible 24/7, students can work on their classes at a time that best fits their schedule. This flexibility allows students to work full or part-time or pursue other extracurricular activities without missing school. Quality Courses – While there is no shortage of “diploma mills” online, there are several legitimate and accredited online high schools, like Pinnacle Education, to choose from. The online high school programs such as Pinnacle offer interesting and interactive courses, as well as an in-depth curriculum that fits every student’s needs for high school graduation. One-on-One Teacher Support – Classroom sizes seem to be expanding at an exponential rate. And with all of these crowded classrooms, finding time for some one-on-one instruction and tutoring with the teacher is virtually impossible. But if a student takes online high school courses, the instructor is just a phone call or email away. Students can even instant message their instructors and participate in interactive online tutoring sessions. Early Graduation/Credit Recovery – Another great advantage of online courses is the ability to graduate early and recover missing course credits. If your student doesn’t need four years to graduate high school, he/she can take additional online courses to accelerate his/her graduation. Or if a student is falling behind or missing course credits, he/she can take online classes along with the traditional courses to make-up any failed or missing credits. You Define Yourself – Along with a customized learning plan, students have more control over their education than they’ve ever had before. Students can work at their own pace and schedule, as well as determine the amount of guidance and instruction needed from their instructor. With online high school classes, students can also avoid the distractions and “drama” that is found on school campuses. This new learning environment gives students the freedom to be themselves and choose the education that best fits their goals and needs. As you can see, enrolling in online high school classes is no longer just a fad. Students and parents alike are beginning to see the benefits of earning a high school diploma online. So while the door to the summer season is coming to a close, a new opportunity in online education has its doors wide open. All you have to do is walk through. ~ by pinnaclepov2224 on July 28, 2011.